“Islamophobia” Crimes Up Despite “Terrorist” Attacks Being Down in U.S.
Mass shootings such as those in Newtown, Connecticut, and Aurora, Colorado, by far exceed the number of those killed in Muslim-related terrorism in the U.S., new research says. “Terrorist” attacks in 2012 are down from 21 in 2011, 26 in 2010 and 49 in 2009, according to the fourth annual report by North Carolina’s Triangle Center on Terrorism and Homeland Security. Ironically, as Muslim-related “terrorist” attacks are down, “Islamophobia” crimes are on the rise in the U.S. Muslim groups across the U.S. are reporting increased rates of anti-Muslim incidents, discrimination and Islamophobia. The San Francisco Bay Area office of the Council of American-Islamic Relations found a 10 per cent increased in anti-Muslim incidents in 2012. CAIR reported 283 separate incides of over the course of the year and included, among other issues issues, complaints of employment discrimination, requests for legal representation for voluntary interviews by FBI and other law enforcement agencies, and reports of hate crimes. The #MyJihad campaign has been launched during a time where research shows that excessive fear of homegrown terrorism by radicalized American Muslims is unfounded. In just 2012 alone, mass shootings claimed lives of at least 66 Americans – “twice as many fatalities as from Muslim-American terrorism in all 11 years since 9/11,” says sociology professor Charles Kurzman. 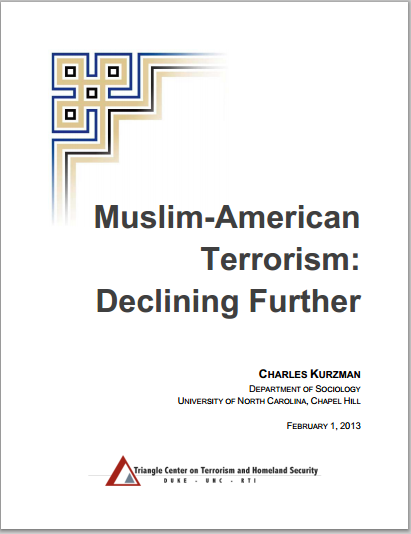 Challenges persist despite the decrease in “terrorist” attacks among Muslim Americans. “Until public opinion starts to recognize the scale of the problem has been lower than we feared, my sense is that public officials are not going to change their policies,” Kurzman was cited by Wired as saying. The FBI continues geo-mapping Muslims regardless of their involvement in any crime, Wired says. Moreover the Patriot Act has been extended until at least 2015 and other contentious post-9/11 laws that remain in place.